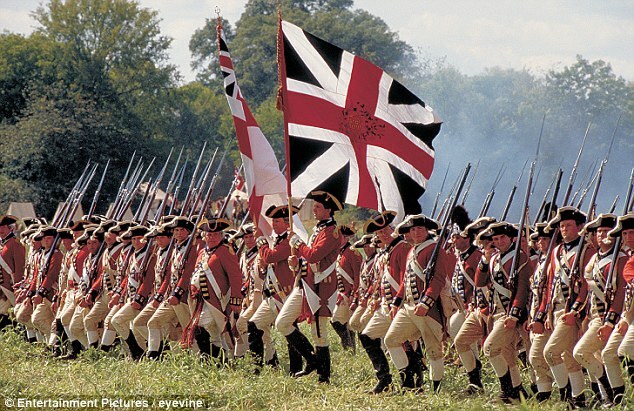 British Redcoat Regulars advancing in the movie the Patriot. 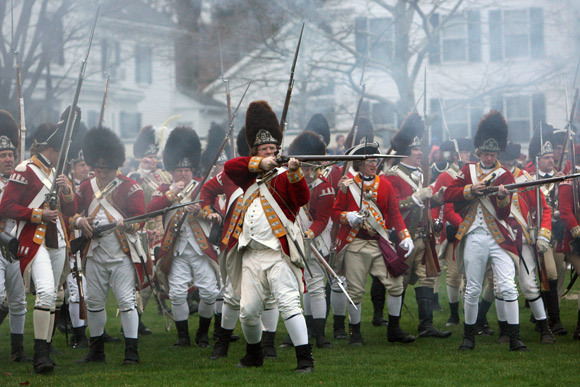 The regulars were part of the British Army’s garrison of Boston and “regulars” meant professional soldiers as opposed to the militia companies of the colonists. Ordinarily there would not have been anything unusual about the regulars coming out. For training purposes and as a reminder to the colonists the King’s troops did often come out for route marches through the countryside. The intent of these marches was peaceful but at the same time meant to convey a show of strength to the more militant of the colonists. By April, 1775 most of New England and especially Massachusetts was ripe for rebellion. The colony was home to Sam Adams and John Hancock and others, often described as hotheads, who stirred up the countryside against the King and his visible representatives, especially the red coated regulars. The redcoats during their marches through the countryside endured much by way of insult from the population. The British officers, even though many held the colonists in contempt ordered restraint. General Gage in Boston commander of the garrison had no desire to create the circumstances that led to an incident similar to the “Boston Massacre” of 1773 where the regulars opened fire on a colonial mob. As things continued to spiral out of control and King George III refused to negotiate with his rebellious subjects the American militia companies of the area began to stock pile more and more military supplies with the idea there would be an eventual fight with the redcoats. Orders came from England that Gage should seize these military stores which included cannon to disarm the rebellion before it began. Another part of the redcoated mission was to seize Adams and Hancock and remove some of the more militant leadership of the imminent rebellion. The red coated regulars of the time period were organized into regiments of ten companies. Rarely at full strength each company probably mustered between 30-40 men. Eight of the companies were known as “hat men” or battalion companies or center companies because of their position in a battle line. They wore the familiar three cornered hat which is why they were called hat men. The other two companies of a regiment were something of an elite within the regiment. One company was the grenadier company and the second was a light infantry company. The grenadiers were selected from the tallest and bravest of the regiment while the light infantry came from smallest men of the regiment but also from the best shots. The grenadiers were lead assaults while the light infantry were supposed to be the regiment’s skirmishers a talent that would be much in demand in the broken terrain of North America. Grenadiers were distinguish by their tall bearskin hats which made them appear even taller and more imposing than they already were. The light infantry wore a type of cap developed during the preceding French and Indian War. It was a roundish affair faced with rigid front plate of leather than was inscribed the regiment’s badge. Both types of companies thought of themselves as elites as did the colonists who faced them. It was British practice to group the grenadier and light companies from the various regiments into provincial battalions to provide that extra punch during an expedition’s mission. Such was the case on April 19th, 1775 when the redcoats matched to Lexington to seize the military stores. The 700 regulars that set off from Boston were the men of grenadier and light companies. They were commanded by Lt. Colonel Francis Smith. A second group, sent to reinforce the first after hostilities broke out would consist of the “hat men” companies commanded by Brigadier General Hugh Percy. Lexington Common, 19th of April 1775. Painting by Don Troiani. 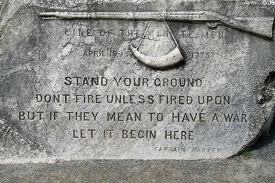 Parker had 77 minutemen compared to 250 British Regulars-that they stood their ground is quite remarkable. The British historian Mark Urban is his excellent book, “Fusiliers” (the history of the 23rd Foot, Royal Welsh Fusiliers in the Revolutionary War) makes the case it was the redcoats that fired first in Lexington. His argument is based on surviving documents that show that at least on that occasion the usually disciplined redcoats were not. Urban’s argument seems to have merit given the hap hazard retreat back into Boston when harassed by thousands of irate American militia. Whatever the case the British Regulars soon regained their prowess and won more battles in America than they lost. Captain Parker’s words are no less meaningful today than they were in 1775. The Redcoats were coming to disarm the militia in much the same manner as our current government seeks to disarm law abiding citizens. Do you know from where “the shot heard round the world” was fired? I am a direct descendant of Mary (Merriam) Taylor and I can’t get enough of this colonial history. The phrase comes from an Emerson poem written long after the War of Independene. Tradition holds the phrase refers to the skirmish at the old North Bridge during the Lexington and Concord events of April, 1775. Thanks for stopping by. I thought I had answered this but recently it popped up again! Hmmmmm. The line is from an Emerson poem from the next century. Presumably, it was uttered on Lexington Green although that is not certain. The other probable place it was uttered was at the North British and the skirmish that took place there. In either case its associated with the first shots of the War of Independence.